As it stands now, we have 1.6 million nursing home residents in the United States; that number is expected to double by the year 2030.1 Bringing advanced wound care to the long-term care arena is becoming more common throughout the country. Physician-based wound groups can bring their expertise to the patient's bedside, thereby saving the patient pain during transport to the wound center and lowering costs. However, certain procedures—such as total contact casting and bioengineered skin substitutes—cannot be performed at the bedside because of billing and reimbursement guidelines. Utilizing a wound care physician-based group has many advantages in long-term care. Residents build a trusting relationship with their providers who come weekly to assess and treat their wounds. Wound rounds are also the perfect opportunity for the physician and nurse to collaborate. However, providers tend to have somewhat of a learning curve, as well as culture shock stepping into the long-term care arena for the first time. Being competent in wound care is not sufficient to work as a provider in this setting. The long-term care arena is surprisingly different from the hospital. The best way to describe it is, you are on their turf. 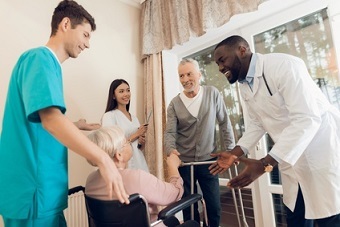 Nursing homes are under a microscope, and federal regulations must be followed accordingly or facilities are at risk for fines and penalties. Providers must be compliant with the state survey process and associated wound care federal tags (F-tags; F686, F710, F841). Substandard documentation tops the list of mistakes for long-term care facilities. It involves "all hands in the chart" so to speak. This encompasses all disciplines, from the nursing assistant to the physician. The most common documentation mistakes are with moisture-associated skin damage versus pressure ulcer and with pressure ulcer staging. Discrepancies and gaps in documentation put the facility and provider at risk of litigation. Impeccable documentation is essential in defending any case. Implementing a "safety net" consists of educating staff about the importance of timely and detailed documentation, not only for the facility, but also for their license. Often, clinicians are not aware of the legal repercussions of their actions. Surveyors also consider other related F-tags during investigations for compliance. There are numerous physician-based wound care groups and/or independent providers across the United States. The goal is to provide a comprehensive wound care solution and safety net for the nursing home. There is an array of different offerings with the larger physician-based group practices, but, bottom line, the documentation needs to be consistent and impeccable. 1. Jones A. The National Nursing Home Survey: 1999 summary. Vital Health Stat 2002;13:1–116. 2. Centers for Medicare and Medicaid Services. CMS Manual System, pub. 100-07: State Operations Provider Certification, appendix PP, F-Tag 314: current guidance to surveyors . 3. Nursing Home Pro. Scope and severity – how nursing homes are really graded. Nursing Home Pro, 2009. http://www.nursinghomepro.com/33/scope-severity-how-nursing-homes-are-re.... Accessed on July 13, 2018 . 4. Centers for Medicare and Medicaid Services. CMS Manual System, pub. 100-07: State Operations Provider Certification, appendix PP for phase 2, F-Tag revisions, and related issues, F-Tag 686: current guidance to surveyors. 5. Carver C. WoundSource Blog: the hidden challenges of wound care in long term care facilities. WoundSource, 2015. https://www.woundsource.com/blog/hidden-challenges-wound-care-in-long-te.... Accessed on July 12, 2018. 6. Carver C. WoundSource blog: does your facility have a legal safety net? WoundSource, 2015. https://www.woundsource.com/blog/does-your-facility-have-legal-safety-ne.... Accessed on July 12, 2018. Cheryl Carver's experience includes over a decade of hospital wound care and hyperbaric medicine. She currently works as a Clinical Specialist for a leading independent provider of wound care solutions for long term care facilities in the United States, American Medical Technologies a d/b/a of Gordian Medical, Inc. Carver is not only known for her knowledge and expertise, but for enjoying her vocation as much as anyone possibly could. Her strong passion is driven from a life long list of personal experiences as a caregiver. Her mother passed away in in her arms at the young age of 47, due to complications from diabetes, amputation, and pressure ulcers. She now has dedicated her professional career to wound care education in hopes to bolster quality of care and strengthen pressure ulcer prevention. She has received many high reviews from her fellow physician and nurse students from across the country, including but not limited to: plastic surgeons, cardio-thoracic surgeons, general surgeons with wound care experience. Ms. Carver single-handedly developed a comprehensive educational training manual for onboarding physicians and is the star of disease specific educational video sessions accessible to employee providers and colleagues.